Note: This post has needed a direction for about a week, and the Syracuse win finally afforded it that. Michigan fans know well the horrors of single-elimination postseason tournaments. The various heartbreaking hockey losses make these most explicit, but even the ups and downs of recent NCAA basketball tournaments have provided their fair share of disappointment. In the end though, those losses offer the denouement of the season's story and usually a fitting end that had been building until the final buzzer. Shawn Hunwick could only hold back the flood waters for so long without support before the team crumbled. 2011's NCAA heartbreaker against Duke showed that, though Michigan's basketball team wasn't at the mountaintop yet, it was on its way with a firm foothold. I've never been good with historical context, so what happens when your team just keeps winning? The Fab Five comparison is embarrassingly easy to the point of being fiction--even Jalen Rose is calling for the end of this comparison now. The Fab Five won largely on talent alone: that many players with that much talent will win no matter what. Coaching becomes secondary in 90% of your games and only becomes important in those crucial moments when the heat is really on, say, when you're down two points in the NCAA championship game and you don't have any timeouts left. John Beilein remains widely heralded by his contemporaries as one of the best coaches in college basketball. His teams frequently exceed expectations, both during the season and in the NCAA tournament. Steve Fisher believes his team was just beaten by Florida State. On a seven-point Likert scale, most readers would list my pessimism about this Michigan team well on the higher end. 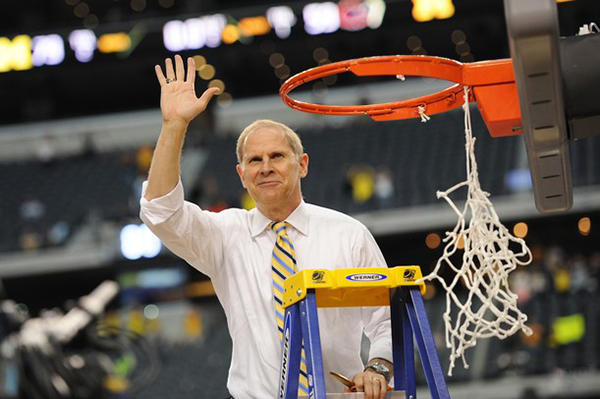 I've criticized the team's athleticism, Trey Burke, and Nik Stauskas, but the one thing I've maintained complete faith in this season is John Beilein. A few years ago, I complained that Beilein wasn't able to bring in the athletes that would allow Michigan to compete on a national level because at the time, Laval Lucas-Perry was Michigan's idea of a savior. Things were not going well. A few years later, Beilein is surrounding by his players and being crowned with a recently cut-down net before sheepishly taking it off and bestowing the honor to Tim Hardaway Jr.
Syracuse has been smothering teams during this tournament and it was up to John Beilein to figure out how to get Michigan quality looks on offense. Though it started defensively--rebounding the ball and getting buckets in transition--it became quickly clear that Beilein had a few offensive sets that were designed to beat the 2-3 zone. The most impactful was a 1-4 offensive set with the ball at the top of the key and four Michigan players lined up in the middle of the Syracuse zone. Though not a great screenshot of exactly how this offense was working, it displays how Michigan was able to dominate Syracuse's zone. Trey Burke enters the ball into the high post for Mitch McGary. When that happens, the two wings players sink to the corners and the other high post player (GR3) dives to the basket. The defender in the middle of the 2-3 zone has to stay high on McGary, forcing the back to defenders to guard three Michigan players: two corner three point shooters or a layup inside. It's football's smash concept run against a 2-3 zone, and one of the more spectacular schematic deployments I've seen in basketball recently (I might be biased). How else do you think Mitch McGary led the team with 6 assists? How did he get those wide open elbow jumpers (if the middle defender in the zone sinks with the inside dive, McGary was wide open)? How do you think Caris Levert got wide-open corner threes when Syracuse has the ability to close out like this? Michigan ran this set over and over again in the first half and there was nothing Syracuse could do to stop it. The Orange had a scheme and stuck to it. Beilein had adjustments that broke Syracuse's only solution. Michigan now goes up against a storyline in Kevin Ware and Louisville, but this feels like John Beilein's time. He embarrassed the "Havoc" defense and solved Syracuse's dominant 2-3 zone. And late in games, when lesser coaches would be wont to stick with their hot hand in Mitch McGary, twice now, Beilein has gone offense-for-defense allowing Jordan Morgan to make defensive plays to help seal Michigan wins. Louisville's defense presents one final challenge for Beilein: breaking a trap, something that Michigan has done successfully all year under the guiding hand of Trey Burke. Beilein will be there to right the ship if things go awry, but against Louisville, he'll act more like the terrified parent giving the car keys to his recently licensed 16-year-old: I've given you the tools and the preparation not to steer this into a ditch; do me proud. Regardless of storylines, Louisville and Michigan present an interesting matchup, but at this point, can anyone bet against John Beilein?